First a story about a struggle—Howard Slusher, a battle-hardened players' agent, vs. Al Davis, the L.A. Raiders' boss. It went into the record books as a victory for Slusher. It wasn't. It was a victory for both of them. But the way Davis handled the situation from beginning to end provides insight into why the Raiders dominate pro football. The story begins on Thursday, Oct. 20, 1983. Slusher is in Houston and he's sweating. The New Jersey Generals are giving him the business. He has flown from his Los Angeles office to Houston for the USFL owners meetings to try to nail down a deal with Generals owner Donald Trump, a blockbuster $17.5 million package that would send eight Slusher clients from the NFL to the New Jersey club: Gary Barbaro, Jeris White, Marc Wilson and Mike Haynes for the '84 season, Randy White, John Jefferson, Bob Brudzinski and Doug Martin in future years. Now the deal is collapsing. Trump has already broken two appointments. Finally, they meet, briefly, in a hotel room. "Waddya got? I'm in a hurry," Trump says. He tells Slusher the package deal is out—he doesn't want to sign up futures. He doesn't like the price for Haynes, the Patriots' All-Pro cornerback who's sitting out the NFL season in a contract dispute. Ditto Wilson, the L.A. Raiders' backup quarterback. Cornerback White, a Washington holdout, is a maybe. And free safety Barbaro, who's holding out at Kansas City, is negotiable. They talk, and Slusher realizes that Wilson is the guy the Generals are really after. Wilson is unhappy that he's not starting for Davis's Raiders. His 1983 L.A. salary is $400,000. Slusher's asking Trump for $1 million a year for four seasons. Too high, the Generals say, but they're interested. And they're talking. Then the Generals put an offer on the table: $4 million for five years, all guaranteed. "Fly him into New York and sign him and you've got yourself a deal," Slusher says. The Generals tell Slusher to hold off a little while. Everything is very hush-hush, closed-door stuff. Slusher flies back to L.A. that night. He phones Wilson and they set up a 6 a.m. meeting at the Wooden Shoe, a coffee shop in Redondo Beach. He hangs up near midnight. At 1:30 a.m. Davis calls Slusher. He knows all about the Generals' offer—the numbers, the years, everything. Davis wants to meet with Slusher the following week. "Too late," Slusher tells him. How about 48 hours? Too late. "Look, you owe me a shot," Davis says. "Just give me a number." Slusher tells him a million a year. "I'll think about it and get back to you in 24 hours," Davis says. "Too late. I'm going to New York at noon," Slusher says. "Don't put any six-hour time limit on me," Davis says. They agree to meet in the Raider office at 11 a.m. Meanwhile, Wilson is having second thoughts. Jim Plunkett had started for the Raiders all season, but the Raiders had announced that Wilson would start Sunday night in Dallas. The Generals didn't look so inviting anymore. "Al's master stroke," Slusher says. "Somebody's finally telling Wilson, 'Good boy.' I'll give Al all the credit in the world for that." At breakfast at the Wooden Shoe, Slusher tells Wilson he's meeting with Davis that morning. He asks Wilson to name a price. Wilson writes $900,000 a year on a napkin. Slusher draws up a proposal and presents it to Davis that morning. Davis looks at it and curses. The phone rings. Davis excuses himself and leaves the office. "It had to be a signal," Slusher says. "I was ready for it." Davis comes back in. "You know who that was?" he says. "The Generals. You don't have an offer." Slusher starts packing his stuff. "I've got a signed contract," he says. "I guess you're not going to show it to me," Davis says. They stare at each other. Bluff and counter-bluff. "I was nuts by then. I didn't know what was going to happen," Slusher said recently. "I was thinking they might stash Wilson, or rough me up...you know, crazy thoughts." Davis curses again and initials the proposal Slusher had drawn up for Wilson. The terms: the original $400,000 for 1983 and a package for the next four years that would bring the five-year average close to $800,000. "Don't announce anything," Slusher says. "I want to tell the Generals myself." "We never announce signings," Davis says. Five minutes later Slusher places a call to New Jersey from the office of Al LoCasale, Davis's executive assistant. He talks to Jason Seltzer, the Generals' president. "I know. He just signed with the Raiders," Seltzer says. "How the hell do you know?" Slusher says. "I have my sources," Seltzer says. "Look, we had a deal." "No," Slusher says. "I wanted to fly him back and you refused." The story breaks that night, Friday, Oct. 21. Trump says he never wanted Wilson. "I'm not interested in backup quarterbacks.... They [Slusher and Wilson] played Al Davis like a drum," he says. "That was the alltimer," Slusher says now. " 'Played him like a drum.' Nobody plays Al Davis like a drum. Look what you've got. Al ended up with the guy he wanted. And in New Jersey you've got a man whose ego is so great he didn't want to let it look like he lost a player. He could've said, 'Look, we didn't get this guy, but we're gonna go after so-and-so,' and made a positive statement. Instead he lies." That Sunday night, against the Cowboys, Wilson passed for 318 yards and three touchdowns in L.A.'s 40-38 win. He led the Raider drive that produced Chris Bahr's game-winning field goal with 20 seconds to play. That victory was particularly important to Davis because it tied the Raiders with Dallas for most NFL regular-season wins in the last 21 years, the period that Davis has been with the club. At the end of the season the Raiders led Dallas by one victory, 206 to 205. They'd already established themselves as No. 1 in won-lost percentage (.715 to Dallas's .693). And what does the Wilson story tell you about Davis and the Raiders? •They will not lose a player they really want. Wilson is now their quarterback of the future, and they don't have to worry about the USFL chasing him until 1987. •Davis may have a legendary ego, but he will not let it stand in the way of improving the team. •Davis has an eye for who can play the game. •Davis has a pipeline to everywhere. He's wired to what's going on around the league—and around the other league. •The Raiders are the winningest team in the NFL over the last 21 years. May 6, 1984, The International Ballroom of the Beverly Hilton Hotel: The Raiders are showing their 1983 highlights film. Some 500 people have gathered. There are four buffet lines and a 60-foot bar. A trophy case holds three silver footballs, the trophies from three Super Bowl triumphs, including 1984. From the ceiling hang banners representing four AFL or AFC championships. Players mingle in a crowd sprinkled with celebrities—state senators and congressmen and entertainers. Jane Fonda and her husband, Tom Hayden, chitchat with fullback Frank Hawkins. Hawkins and defensive end Howie Long have just played in a celebrity flag football game with Cathy Lee Crosby. Marcus Allen is talking about a future assignment, helping to judge the Miss Universe contest. All-Pro tight end Todd Christensen, once a Cowboy castoff, is telling somebody about his new TV show, his own, which reaches 80 markets. The 22-minute highlights film is over. LoCasale adjusts the microphone for his height, or lack of it. Little Al, they call the 5'4", 175-pound LoCasale. Davis is Big Al. "In 1983 our team battled not only opponents on the field," LoCasale says, "but a powerful combination of the NFL's propaganda machine, the federal courts, the state courts, the halls of Congress. I can assure you their campaign to prevent the Los Angeles Raiders from being the world champion Los Angeles Raiders will not go unchallenged. Our goal is the same in the courts as on the field: Just win, baby!" There is applause, some cheers. A few players and coaches smile. They didn't need all the hassle. They'd be happier back in Oakland. The Raiders moved from Oakland to L.A. in 1982 after winning a lengthy legal battle against the NFL. There are players and coaches, including coach Tom Flores, who haven't yet moved their families to L.A. They're not happy about the suitcase life. It's a distraction. But the problems haven't shown up on the field. In strike-torn 1982, their first year in L.A., the Raiders went 8-1, tying the Redskins for the NFL's best record. In '84 they won their third Super Bowl. After L.A. beat Washington 38-9, the most crushing Super Bowl triumph ever, Davis said: "Wait. You ain't seen nothin' yet. We'll be even better next year." The Raiders are relentless—also slightly paranoid. To longtime Raider watchers, LoCasale's speech was a classic. Us against them, boys. Tighten up. In the old days the Raiders' distrust of outsiders was so great, their fear of secrets leaking so consuming, that they wouldn't even announce their roster cuts. The team's beat writers went crazy; they had to call the league office to find what the Raiders were doing on cutdown days. Raider press releases wouldn't even have a depth chart for the upcoming game. And if you wanted to know about an injury, well, forget it. The typical Raider release would tell you about statistical milestones, where players went to high school, kindergarten—everything except what you wanted to know. The players seldom knew what was going on, either. But paranoia works both ways. The outside world has always been paranoid about the Raiders, too. A New York bartender somehow got through on the phone to Jet coach Walt Michaels at halftime of the '82 Raiders-Jets playoff game in L.A., and after the game Michaels said, "There's an s.o.b. who tried to disrupt our team at halftime and his name is Al Davis." Security at the Jets' Long Island camp had been frantically tight the week before that game. The Al Davis-Harland Svare story is an AFL classic. The rumor was that the visiting team's locker in the Oakland Alameda Coliseum room was bugged. One year when Svare was coaching the Chargers in a game against the Raiders in Oakland, he stared up at a locker-room light fixture, shook his fist and said, "Damn you, Al Davis, damn you. I know you're up there." Svare's line became a book title. Oh yes, everyone's paranoid about the Raiders—players, coaches, especially the league. Last year Slusher and the Raiders finessed a trade with New England for Haynes through the league office after the trading deadline had expired. The deal got L.A. an All-Pro cornerback and firmed up the team's pass defense. Slusher remembers what happened when Haynes's contract was finally signed, in the L.A. County Courthouse. "One of the league lawyers said, 'What if Al refuses to give New England his first-round pick?' " Slusher says. "But that wasn't the height of the paranoia. That came when my 15-year-old son, John, went downstairs to Xerox the contract. Two NFL guys went with him. They didn't want to let it out of their sight." Distrusted and distrustful, hated in some quarters, admired in others, the Raiders draw together, thumb their noses at the world and carry on. You see, their thing is winning, the big W. "Commitment to excellence," they call it. It's there on the back of their press guide, the new motto, after "pro football's dynamic organization" and "pride and poise." It was on all the billboards the Raiders rented around Tampa before the last Super Bowl. Win, dammit, win! With their 21-year-winning-percentage supremacy in the NFL, the Raiders are now taking on all professional sports. "We stand at .715," their highlights film proclaims. Best of the also-rans over the same span are the Montreal Canadiens (.666), the Boston Celtics (.652) and the Baltimore Orioles (.585). Europe comes next. Hey, look up Real Madrid's record in soccer. What are their secrets, their little tricks? How have they done it? Well, not with formations, not with gimmickry or an ultracerebral approach. "I used to love to play Oakland," says Andy Russell, the Steelers' former All-Pro linebacker. "They'd say, 'Here's what we're gonna do. You think you can stop it, go ahead.' It makes it easier." "Yeah, but look at the guys that were doing it," says Jack Lambert, the Steeler linebacker. "A bunch of guys who do nothing but spit in your face, who play the game aggressively—the way it's supposed to be played." Well, that's part of it, but not all of it. First of all, there's a thing called Raider Football. It represents a style that has stayed remarkably consistent throughout Davis's 21 years. Plus, there's a concept. And it all begins with Davis himself. Davis, who is now 55, grew up in the World War II era, and loved military history. He was fascinated by the frightening power of the Wehrmacht, the armed forces of the Third Reich. He read about the German army's deep lightning thrusts through Poland, the great disruptive power, the size of the force, its speed. And then he saw its demise—the fragmented command, the defeat at the hands of a well-equipped and organized army backed by rich resources and fed by smooth supply lines. Eighteen years later, in 1963, Davis had a command of his own, the Oakland Raiders. He was their coach and general manager, later to become part owner and managing general partner. Why, he asked of himself, couldn't military principles be applied to football? Why not an attack that is always looking to strike deeply and swiftly, a defense that is reckless and destructive and manned by big, punishing people? Size always has been a high priority item with Davis. To achieve this, he would need an organization with continuity, no fragmentation, everybody going in the same direction. And finally, the troops would be well paid. All these elements became the trademarks of Raider Football. When Davis thinks of trades and drafts, the question that has to be answered is: Can this guy play our style? "It's not a complicated theory, really," says Mike Giddings, owner of Pro Scout, Inc., a private scouting combine for eight NFL clubs, but never the Raiders. "Find the best people, get 'em to play your style, pay them the most money, and wait for other teams to screw up. And as long as the league keeps handing him people like Mike Haynes, he'll be in business." 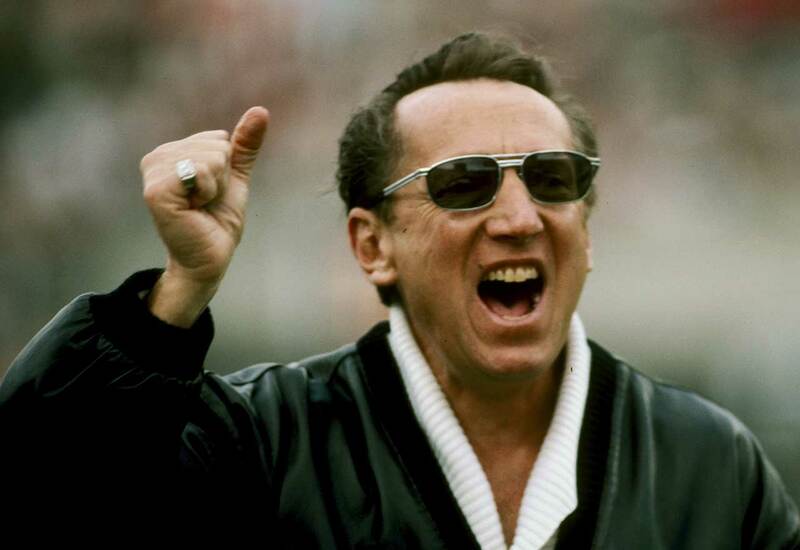 "Al Davis is unique in the modern era," says Cleveland coach Sam Rutigliano. "Look at all the hats he's worn—scout, coach, assistant coach, G.M., owner, even commissioner. Don't forget he was once commissioner of the old AFL. How many guys have gone to the owners meetings one week and walked the sidelines at a college practice the next? Maybe George Halas was like that in the old days, but this is a different era." "The bottom line here is winning—not image or money," says Steve Ortmayer, L.A.'s special teams coach. "He gives you a chance to win," says Chet Franklin, the defensive backfield coach. "I was with Kansas City for three years. [Coach] Paul Wiggin never was in a situation where he had a chance to win. They knew about auditing and p.r. and marketing in K.C., they ran a nice show. But Paul was in the football business and they weren't. The Raiders aren't much for marketing their team. Their p.r. department is a joke. They win. That's their p.r.," Giddings says. The bulk of their money goes to salaries, and the other areas get shortchanged. "They probably spend less on college scouting than any other organization in the NFL," one player personnel director says. "Their thing is trading. They're always in the bottom half of the league in the number of high draft choices on their roster, but they lead the league in trades." On their '84 Super Bowl roster, the Raiders had nine veterans acquired in trades: Five were starters, a sixth the nickel back, another a Pro Bowl choice as punt and kick returner. The same roster listed six first-round draft choices and five No. 2's. Their second-round choices in the last decade—defensive end Howie Long and linebacker Matt Millen, to name two—have been better than their firsts. The Raiders don't belong to a scouting combine. Computer grading has never been their style. They don't care about a guy's vertical jump or how many pull-ups he can do. They go on instinct. "One team gave me a pinch test, to test my fat content," Long says. "The guy said, 'You're a little chubby there, son.' I ran two 40s in Oakland in rookie camp. You know how many I've run since? Zippo. I can do 80 push-ups in a minute and dunk a basketball any way you want, but I can only do two pull-ups. These teams that make you do dips, bench presses and aerobics, that drop you into a sensory-deprivation tank to test your body fat...you think Al would go for that? "Earl Leggett, the Raiders' defensive-line coach, came down to Villanova to look at me," Long continues. "He ran me in one 20. He asked me to get in a stance, take a step upheld, plant and come inside. Then he left. I said, 'That's it. There's one team I can forget about,' and I went back to my room and turned on Leave It to Beaver." Long was a crucial pick for the Raiders. Part of the concept of Raider Football involves drafting or trading for players to fill certain roles, and the Raiders' style demands a big, reckless left defensive end. They want a guy who can cave in a side, come down the line and occupy two blockers, freeing the linebackers to make the tackle. It's vital for their defense. Ike Lassiter filled the role in the 1960s. John Matuszak was effective for a while but when he started to show some mileage, the Raiders got Long. The second responsibility, traditionally, of the left defensive end is that he must be able to move inside and play tackle or middle guard if necessary. Long, who was a middle guard one year in college, moves all over the line in nickel situations, usually lining up over the center. Davis has always liked to move people around on defense. His first rover, a player who can play either on the line or up in a linebacker stance, was Dan Birdwell, whose versatility gave the Raiders a 3-4 look in 1964, eight years before Miami's famed 53 defense. Hendricks played as a rover for a while. Now the Raiders have gone more to a move concept, with Long the prime mover. The Raiders have often gotten a particular player to stop a specific threat on another team. In 1967 they drafted left guard Gene Upshaw to control the Chiefs' 6'7", 275-pound Buck Buchanan. Bubba Smith had a big game against the Raiders in the '70 playoffs, so the next year Davis traded for 275-pound right tackle Bob Brown, the Boomer, in an attempt to nullify Bubba. Later, he traded for Bubba himself. "The Raiders are consistently the most effective team in the NFL in filling needs, which is crucial to upgrading a team," Giddings says. "They went into the last season with what I saw as seven needs. They filled six of them, a remarkable percentage." In 1970, Miami receiver Paul Warfield was terrorizing the NFL on slant-in passes, the Quick I. So the next year the Raiders drafted Jack Tatum on the first round, and Tatum applied Davis's concept of a killer free safety. "An obstructionist, Jack's the greatest obstructionist there has ever been," Davis says. "He put the fear of God in 'em by his location in the middle of the field. Myrel Moore, a Denver assistant, told me that once they were putting in a play against us where Rick Upchurch had to go inside, into the post, and he said, 'Uh-uh, I'm not going in there.' So they took it out." The Raider who now fills that spot is Vann McElroy, a rough jarring tackier who made the 1984 Pro Bowl. The killer free safety allows the cornerbacks to funnel things toward the middle, to play the outside-conscious, bump-and-run coverage that has always been part of the Raiders' style. It's a basketball approach to pass defense. Davis said he got the idea from watching John Wooden's zone press at UCLA, also from seeing a talented young Denver cornerback named Willie Brown, who played bump-and-run instinctively. The Raiders traded for Brown in 1967 and then went to the bump-and-run almost exclusively. "Everyone was getting hurt by timed patterns," Davis says. "The bump-and-run took them away. I just said, 'The hell with it. We'll play up on 'em and give the free safety a clean read.' "
Lester Hayes, L.A.'s left cornerback, has been a natural at it. Right cornerback was a problem, but when Davis obtained Haynes last November, the problem was solved. The Raiders could go back to bump-and-run. No team completed 50% of its passes against L.A. in the playoffs, and L.A. did a remarkable job of shutting down Joe Theismann and his wide-out attack in the Super Bowl. The companion to the bump-and-run is pressure on the quarterback. "The Raiders proved that you can win in this era with great cornerbacks and a pass rush," says one NFL coach. The right defensive end is the Raiders' sacking end, as he is on most teams. But not every team goes to the same pains to find pass rushers—and develop them—as the Raiders do. It started with Ben Davidson, who'd been a skinny 6'8" hurdler in college. Davidson washed out of three NFL camps, but Davis got hold of him and did a psychological reclamation project, turning the timid youngster into a raging terror. Davis has brought in older vets to man the position—Pat Toomay, Cedrick Hardman and, the most successful of all, Lyle Alzado—and he has gone with rookies. He's had power rushers like Davidson and speed rushers like Toomay, Dave Browning and the current sack specialist, Greg Townsend. But pass rushers have always been there. Davis has to have them. The Raiders don't blitz much. Their rush comes mostly from the down linemen ("I got 12 of my 13 sacks last year off a three-man line," Long says). L.A. shoots for mismatches, trying to get the strongest defensive lineman on the weakest blocker. Occasionally, the Raiders will concentrate their whole game plan on an opposing offensive lineman, as they did with Cincinnati's inexperienced center, Dave Rimington, early last year, giving him an ungodly assortment of shifts and stunts to worry about. They're Al's babies, those defensive linemen, and they're handled very carefully. "They'll try to save your legs," Alzado says. "Leggett is very conscious of that. He doesn't want you standing around when it's 40 below zero, like some clubs." "They're especially easy on middle guards," Long says. "They know a middle guard's legs only have two full practices in them a week. They're teachers here, too. When I came here I didn't know anything. I didn't even know what the formations meant. Now I can pick them apart, piece by piece, and put them together again." Most of the Raiders' blitzing is done by the strong safety, Mike Davis, a 205-pound former high hurdler who was drafted to pressure quarterbacks. "Jet Rip Blue Slash," Long says. "That's our safety blitz. In the Super Bowl, Mike came in clean on it twice in a row...he had a clean shot on Theismann. Just give me one shot like that and Theismann won't be doing Igloo cooler commercials anymore. He'd be doing spots for a nursing home." The phrase in football that Davis finds most annoying is: "We've got to control the ball and keep our defense off the field." "I heard one of our coaches say it in a meeting once, a new coach," Davis says. "I was on my way to the parking lot. I came back in and told him, 'Look, the idea is to outscore 'em,' and all the coaches started laughing. Tom Flores said, 'I just told him that.' "
Everyone knows that the Raider offensive trademark is length. Patterns stretch longer, quarterbacks hold the ball longer, linemen hold their blocks longer. It's the big strike, concept, a throwback to Davis's early years on Sid Gillman's Charger staff. "Attack, fear, pressure," Davis says. "Don't take what they give you. You're going deep and they're not going to stop you by design or location. They have to do it on the field. Screw it. You say you can stop us. Prove it." The Raiders' offensive system is almost unique nowadays in that quarterbacks call their own plays. "You have no idea what our huddle is like," Christensen says. "[Running back] Greg Pruitt will come in, for instance, and he'll say, 'Tom wants 19 flip.' [Tackle] Henry Lawrence'll say, 'Nan, that won't work.' I'll say, 'Jim, you're the QB.' Jim'll say, 'Henry's right. Forget it,' and he'll call something else. Do you know how valuable it is for a team to have a huddle like that? As John Madden says, 'The coaches are the theoreticians. The guys in the huddle are the combat troops.' "
In Al's early years the Raiders ran a trap-blocking offense, but now there's very little finesse and much straight-ahead power. The overall offensive concept has something to do with that. The Raiders look for big pass blockers when they're drafting offensive linemen, guys who function better as straight-ahead run blockers. The turf figures, too. The Oakland Coliseum became their home field in '66, and the ground there was naturally heavy and soggy, built for big linemen. It was tough to run a trap-block offense, as Pittsburgh does on its artificial turf. And though they've moved to L.A., the Raiders still play on grass. Davis points to another key to his offensive operation—the split end, almost always lined up left. "It has been the hub of our attack," he says. "We've only had five in 21 years—Art Powell, Bill Miller, Warren Wells, Mike Siani and Cliff Branch. That's our deep threat position." As for the myths that surround Davis and the Raiders, let's examine some of them. Myth: Davis will do anything, but anything, to win. Reality: Davis has calmed down, at least in his on-the-field operation. In the old days he was wild. He sneaked a construction crew into Shea Stadium in the middle of the night and set up a heating unit by his team's bench for the '68 championship game against the Jets. His workmen once interrupted a Jet practice in Oakland and started rolling tarps on the field. When the AFL and NFL were battling and the race was on to sign players, he once phoned Syracuse guard Walt Sweeney at 3 a.m. E.S.T. "What did you do that for?" LoCasale asked him. "Just so he'll remember me," Davis said. "He'll sure as hell remember the guy who woke him up at 3 a.m." His move to L.A. earned him many enemies among owners and league people, but longtime Davis watchers say he has mellowed. "Three Super Bowls plus Tom Flores have done that," an associate says. "Tom has been a great influence on him." Myth: The visiting team's locker room really was bugged, as Svare said. And Davis has recording devices concealed throughout the NFL. Reality: No one knows. Davis laughs at the Svare outburst. "Ah, hell, it wasn't in the light fixture," he says. Former Raider p.r. man Lee Grosscup once said, "I don't know about the locker, but you can bet that every office is bugged." Myth: There are Al Davis spies everywhere. Reality: Oh, he had 'em in the old days. Once, when the Jets were riding the bus back to their hotel after a Saturday practice in Oakland, Weeb Ewbank looked around and spotted Raider scout Maury Schleicher in a rear seat. Trembling with rage, the Jet coach had the driver stop the bus in the middle of Route 17, and Schleicher was ejected. Now? "I want to be candid with you," he says. "We do have contacts at every level, on every team. We have people in the USFL we call, too. Look, you're not going to stop communicating. If you think you are, you're crazy." Myth: Davis himself once showed up in the Jets' hotel the night before a game and told Joe Namath what the Raiders were going to do to him. Reality: A misinterpreted story. Davis liked Namath. Always did. He dropped by to pay his respects. His toughest statement was, "You sonofagun, stop killing us." Myth: Raider coaches are rubber stamps. Davis is the real coach. Reality: Christensen calls Flores "a great, great game-day coach, excellent on the sidelines." Other players agree. Davis attends the Wednesday and Thursday practices, sometimes the one on Saturday, and that's all. The coaches drop a game plan on Davis's desk, but he doesn't actually put in plays. "It's a courtesy," Flores says. "Sometimes he doesn't even want to see it. He says, 'I want to be surprised.' But we do discuss general concepts—this tackle doesn't match up well, we can work on this cornerback. And the overall Raiders' concept is his. He just wants me to coach the hell out of it. I always have the last word on game-to-game strategy. I'd be lying if I said I wouldn't like to be a household name, like Al is. But I figure if I keep winning, sooner or later someone's gonna say, 'Hey, Flores must be doing a hell of a job.' "
Myth: The drafts are Davis's drafts, the trades are his trades. Reality: All the coaches get involved in drafting. They're expected to rate the top candidates at the positions they handle, then join Ron Wolf's scouting department and Davis, and thrash it out. Trades are more Davis's thing. Alzado was his baby. Plunkett was worked out by Flores and Wolf; Davis wasn't there and Flores swung the election for Plunkett. In the old days Davis was a terror on draft day. Wolf tells this story: "It's 1967, our first-round pick is coming up and Al and I are battling down. I want Harry Jones, a halfback from Arkansas. He wants Upshaw. We have this speaker set up so we can hear what's going on in the draft room in New York. Finally, Al says to me, 'All right, dammit, you win. Go call Harry Jones and alert him. Use the phone in the hall.' So I go out in the hall and dial, and as I'm dialing I hear over the speaker: 'In the first round the Oakland Raiders select Eugene Upshaw, guard, Texas A&I.' "
Myth: Davis is infallible when it comes to judging talent. Reality: Oh, he has had his clunkers, notably ex-Ram cornerback Monte Jackson, who cost the Raiders three draft choices in the famous Lawrence Welk trade...a-one and a-two and a-three. The coaches had to finally beg Davis to get rid of him. Bubba was a mistake. So was Bob Brown. But Davis was the guy who lobbied hardest for tight end Raymond Chester, when Chester wasn't even listed among the top 150 college prospects by some teams. And it was Davis who personally scouted Mark van Eeghen at an East-West game practice in a gym where the players were all in tennis shorts...and then drafted him in the third round. Van Eeghen is the Raiders' alltime leading rusher. Davis's percentage is very high. Myth: The Raiders are truly the last stop, the haven for outcasts. They've got more druggies than any other team. Reality: One veteran says that when the first Super Bowl practice was called 11 days before the '81 game, only 26 guys showed up. One suppposedly was in Peru. Davis says he doesn't know anything about it. As far as the drug problem, he says, "We've taken care of it from within. At one time we were bad in that regard, but we've learned how to deal with it, and that's through fear of punishment. It's controlled on our club." Translation: If there are problems they're kept within the family. Myth: No one's underpaid on the Raiders. Reality: If a player is performing, Davis will usually upgrade his contract, without request, after two years. Long feels he's underpaid, even though he got a raise last year. Long says he makes $120,000, which, he complains, is "64th-best among NFL defensive ends." "I'll catch him up," Davis says. "Look, I can't do a guy every 15 minutes." So the Raiders' future is promising. After the Super Bowl victory over Washington, Davis said, "We'll be even better next year." But a few months ago, when the players got their rings, he warned them against overconfidence. "It was classic Al Davis," LoCasale says. "He told them, 'You can't talk about it. You've got to do it. Everyone's gonna be shooting for us.' "
ILLUSTRATIONVICTOR JUHASZDavis developed his battle tactics by studying the Third Reich's army, but he doesn't intend to ever go into the tank. ILLUSTRATIONVICTOR JUHASZWith his three Super Bowl trophies and three championship rings, the imperial Davis easily extracts homage from those NFL people his team beats up on. ILLUSTRATIONVICTOR JUHASZThe Raiders couldn't care less what others think about them. ILLUSTRATIONVICTOR JUHASZDavis has always fancied large, hulking linemen, all the better to crush foes into the grass, which has always been the Raiders' home turf. ILLUSTRATIONVICTOR JUHASZIn the Raiders' huddle, the quarterback gets play-calling help from all the troops. ILLUSTRATIONVICTOR JUHASZAlways the host with the most, Davis once rolled out his special green-carpet treatment for the Jets during the middle of practice. ILLUSTRATIONVICTOR JUHASZWeeb went bonkers when he spotted a Davis spy at the back of the Jets' bus. ILLUSTRATIONVICTOR JUHASZDid Davis have a game plan that gave Namath nightmares? ILLUSTRATIONVICTOR JUHASZThe Raiders may be flying high, but they keep drug problems in the family.